Thoughts and stories after the final chapter of Life's Not Over, It Just Looks Different. Knowing how much I can see, or what I see, is one of the hardest things for me to describe to someone. Whenever I’m asked if I can see a particular object or person, I’m happy to answer that question, but it would get very boring for them and for me, if somebody tried to ask me about everything I can see. It’s hard for people to understand because they can’t see through my eyes. I’m not aware of any technology that will really let someone see the world through my eyes. You could put a camera on my head and it would show you where I’m looking and what I’m trying to see, but it still wouldn’t show you how well I see what’s in front of me. Earlier this year I came across a fantastic app for my iPhone called the AIRA Vision Simulator. Which uses the camera on my phone to simulate a variety of different eye conditions. The app simulates about a dozen different conditions, some of which I hear about often from clients at work, like glaucoma, macular degeneration, and retinitis pigmentosa. The app also has a bunch of conditions I’ve never heard about. I’ve used this app in many of my presentations to show people what certain conditions look like, and I’ve suggested it to staff members in seniors’ residences to gain a better understanding of what some of their clients are dealing with. I wish it had cortical visual impairment (CVI) in the app because then I could show it to friends and family to help them understand my condition better, but sadly, it’s not included in the app. Not long after I had downloaded the app my wife went through it and chose a condition that she thought might be close, based on how I’ve described my sight to her. The condition she chose in the app was a decent starting point, but there’s still no substitute for the real thing. Recently, a friend told me one of the things she appreciated after reading my book was that it gave her a better understanding of what I can see or not. She told me that before reading it she didn’t always understand why I was struggling to do certain tasks, or why I seemed to take longer to do things. She’s not alone. I was at the ophthalmologist’s office recently and it always makes me chuckle when I’m doing the visual field test and the technician checks in to see if I’m okay because I’m not pressing the button when I see the sparks on the screen. I always have to tell them, “I’m fine, I’m just waiting for the sparks to show up in areas where I’ll see them.” I can’t fault the technicians for this. I’m sure they don’t have access to my chart to know about my condition before testing me. I just find it funny because it happens on nearly every visit to the doctor’s office. Perhaps I should have them read my book. I’m glad technology like the AIRA simulator app exists, and I’m delighted that at least one person in my life understands my world a little better after reading the book. When in doubt though, it’s good to ask. During my presentations, especially to health care professionals and people who work with vision impaired clients, I always encourage them to ask questions and observe. In my experience, most people with vision loss, myself included, are okay with being asked if we’re able to see something you want to show us, or perhaps ask us how well we see an object you’re holding, and we’ll tell you. We don’t want to play 20 questions any more than you do, but asking us these questions when you’re trying to help us with something is very appreciated. Today, October 21, 2018, marks the 13th anniversary of the discovery of my sight loss. As I sat writing this post, it occurred to me that while the anniversary itself isn’t a happy one, great things can be found in what came out of it. Obviously, if I chose to look at it with the view of what was lost, then yes, I suppose I could feel sad about it. I had to change careers, moving out of the operations side of the television business because I wasn’t able to see screens with the amount of detail needed to do the job well. I haven’t been behind the wheel of a car since 2005, and yes, I miss taking a long, leisurely, highway drive – that is, if you call cruising down the highway at 100 km/h leisurely. Plus, I have trouble seeing the faces of friends, family members, and anyone else I’ve met since October 21, 2005. If I want to look at my life from that perspective, then yes, I would be very sad. But as those who knew me before that fateful day, and likely those who’ve met me since then will tell you, that’s not the way I look at the world. Over the past few months I’ve been looking back at all that has happened since the fall of 2005, and I really like my life. I was in a Chapters store in Calgary yesterday, talking to customers about my book, and I said to more than one of them, “nearly everything I’ve done, and almost everyone I’ve met, including you, (the person in the book store) would not have happened if I hadn’t lost my sight. The fact that I was in the bookstore at all yesterday — was because of my sight loss. Something else that changed about me all those years ago was my desire to read. For the first 30-plus years of my life, I was not a fan of reading, I found it boring. After losing my sight, I started listening to audio books and eventually gravitated toward e-books. At book signings, I like telling customers that one of the things I find ironic is that I can’t actually read my own book in print, but as an e-book, I’ve read it and many others because my phone reads the book to me. For yesterday’s book signing at Chapters, a friend who stopped by pointed out that the book shelf behind my table contained many of the books I’ve read by authors like Carol Dweck, Stephen Covey, and more. I felt like I was in great company. Whether it’s at the book stores, through work, or wherever, I meet a lot of people in my day-to-day activities, and yet, I can’t recognize any of them. I can probably give you a general description of their height, general body shape, and possibly their hair colour, but that’s about it. But honestly, seeing their faces isn’t nearly as important to me as hearing their voices. Many of the people in my life are happy, caring people I enjoy spending time with, and that means more to me than knowing what they look like. It was a few months after we discovered my sight loss that I realized I wouldn’t be able to stay in the job I had been doing in television operations, and maybe I didn’t have to change completely. Perhaps I could have worked in an administrative role in television, but I decided to go a different direction, and looking back on it, I’m glad I did. It wasn’t an easy switch. I had a lot to learn, and some roles I tried didn’t work out so well, but along the way, I met many more people, made some amazing new friends, and eventually my meandering path led me to a dream role doing community education for CNIB. Unlike many people, I enjoy public speaking, and whether I’m talking about the great work we do at CNIB or giving talks about my book, I find being in front of people energizing. Do I get nervous? A little bit, sure. I learned years ago that if I’m not at least a little nervous before speaking in front of a group, somebody had better check my pulse because I might be dead. So yea, I could be sad if I wanted to, but I’d rather not. To me, that would be a boring waste of a life. If you’ve been reading other posts on this blog, have read the book, or have seen me in my favourite blue t-shirt, you already know that I am on this planet for fun. The past 13 years have been a roller coaster of highs and lows, and one heck of an adventure. I have no idea what the next 13 years and more have in store for me, but if there’s fun to be had, I’ll find it. Last month I posted about feeling a renewed sense of determination to see if I could do more to improve my eyesight. Since then, I have written to experts who study CVI (Cortical Visual Impairment) in children to ask if they know anything about the condition in adults. I also did some searching of my own, and I’ve been to my family doctor’s office twice asking her to refer me to specialists in Calgary who I think might know something about my condition and ways to improve it. The results that have come back from those inquiries have been less than satisfying so far. The experts I wrote to have yet to respond, but I’m still hopeful they will eventually reply to my emails. My family doctor and one of her colleagues have been great. They both humoured me and have sent the referrals I requested, which I really appreciate. Unfortunately, one of those referrals, to a group that helps people recover lost function after a stroke, was rejected. The response back was that their office doesn’t deal with lost eyesight as a result of a stroke. It was suggested I should see an ophthalmologist instead. The other referral hasn’t come back yet, so I’m still hopeful on that one. During one of the visits to the doctor’s office, her colleague tried to help with a bit of searching herself. She found a local clinic that specializes in vision therapy and gave me the contact info. I wrote to the clinic and told them a bit of my story, but unfortunately, my condition is out of the scope of what they treat. In the past few weeks, as I’ve been searching for more answers, and possibly some help in the way of exercises I can do to stimulate the affected part of my brain, I’ve been surprised at how little attention seems to be paid to people who lose their eyesight as a result of a stroke. I know I’m not the only person who has lost his sight from a stroke, so I find it odd there isn’t more being done, whether it’s research or actual treatments. While I wait to hear back on my other referral request, and possible responses to my emails, I’m going back to methods that I am fairly certain helped me in the past. I’ve reduced the level of magnification on my Zoom Text software from 4x to 3.5x. I found a website where I can play Tetris for free, which I do at least once a day, and I’ve also reduced the level of magnification on my CCTV for reading books. In about four weeks I’ll be visiting the ophthalmologist, an appointment that was already scheduled, and as recommended, I’ll ask him more about my condition and see if he has any ideas. One of my colleagues at work, who seems to be just as interested in this as I am, (although, certainly not for the same reasons) has mused that perhaps we’ll have to find a way to study this ourselves. I’m not sure how far we’d get on our own, but I’m hoping I might encounter a student who needs a study project and perhaps we can all work together on finding some answers. There’s an old adage that says, “if you want a job done right, do it yourself,” and maybe that’s what I have to do – although if I meet a scientist or doctor who wants to help, I won’t say no. Over the August long weekend I started reading a book called, The Brain That Changes Itself, because a friend said she thought I would find it interesting. She was correct in her thinking, and after reading only the first two chapters, I was not only hooked on the book itself, I started feeling energized by what I was reading. The Brain That Changes Itself, written by Dr. Norman Doidge, and published in 2007, shares stories of people with a variety of brain afflictions and how, through the wonders of neuroplasticity, scientists were able to figure out the causes of the conditions, and in some cases cure them altogether. As I read chapter five on my way to work a few days ago, I could feel some very strong emotions welling up inside of me. I finished the chapter just before reaching my stop and I could feel my emotions just below the surface. I walked into my workplace, down the hall to my office, closed the door behind me, sat in a chair with my back to the window, and cried. The chapter I had just read focused mainly on people who had suffered strokes affecting various parts of their bodies, or in some cases, an entire side of the patient’s body, and the specialized treatment they received that had helped them regain some, or all of the function they had lost to the stroke. As I read those pages, my mind drifted back to my own stroke in 2005. If there were treatments or exercises that could have been employed to help me regain some of my sight, why hadn’t the doctors or therapists said anything or tried something? That thought kept running through my head after reading the book that morning, and I was feeling a mix of sadness and anger. I sat in my office chair and let the tears flow for a few minutes, and then I started to change gears. The book suggested that stroke patients older than me had achieved some level of success with their recovery, so I thought, “Why couldn’t I?” I dried my eyes and felt a renewed sense of optimism and determination to try and regain more of my sight. If, as the book suggests, there is no age limit to a person’s ability to recover, then I’m going to try it. And I don’t plan to try it alone. Cindy is fully supportive of the idea, and I’ve started reaching out to people in the scientific community, as well as individuals or groups who know about cortical visual impairment (CVI) to find out if there are exercises or tasks I can do that might help me. I have to admit, for the past ten years or so I hadn’t really been trying to regain my sight. After the doctors told me they thought I was done recovering, and once I reached a point where I didn’t feel I was improving, I settled for what I had, and that’s basically where I’ve been for the past decade. But now, like a cold case that gets reopened when new evidence comes to light, I’m back on the case. I don’t know if I can regain more of my vision or not, but it’s worth a shot. If it turns out that this is as good as it gets, so be it, at least I will know I tried. So, thank you to my friend Tracy for recommending the book, and thank you to Dr. Doidge for writing it. I’ve got my “Just watch me” attitude on, and I’m ready to go! Popularized by the movie of the same name, a bucket list is something many people seem to have, although for most people, it’s not a written list, but rather a mental series of items they would put on a list if they were to actually sit and write it out. A bucket list is a collection of things a person wants to do before he or she dies, or ‘kicks the bucket’, as the saying goes. I have a list too, but I prefer to call it a to-do list because I don’t see myself dying anytime soon. So, what goes on a to-do list? Everyone’s list is different, but mine consists of things I want to see and experience, as well as places I want to visit in my lifetime. Last week, I had the opportunity to put a check in the done column for an item that had been on my to-do list for many years. I wanted to visit the White Otter Castle in northwestern Ontario. Last year, one of my cousins put out the word she wanted to host a family reunion in our hometown. While planning the trip, I decided it was also a great opportunity to try and visit the castle, since I’d be in that part of the country anyway. The big question was how to get there? The castle is in a remote part of Ontario, so if I was going to get there, it would take some planning. I made a few inquiries and it was suggested I call Brown’s Clearwater West Lodge, a popular camping and fishing destination in the region. I called and reached Carol, one of the owners, and told her what I had in mind. She said they could definitely help me achieve my goal. After spending a few days with my cousins in Atikokan, Ontario, Laura, a staff member at Brown’s picked me up in town and drove me to the camp. Before I arrived, Carol had told me someone from the camp would take me to see the castle, rain or shine. On the day of the trip, it looked like we’d see more rain than shine, so we decided to go an hour sooner than originally planned to try and beat some ominous looking storm clouds. Mike, a long-time member of the Brown’s staff, was my guide for the trip. He and I set out for the hour-long boat ride to the castle. The water was a little choppy, which made me somewhat nervous, but Mike assured me we’d be fine. To be honest, I think he drove a little more slowly than normal to keep this city kid calm! On the other side of Clearwater lake, Mike loaded the boat onto a waiting truck and trailer for the portage to White Otter lake. That was much different than the portages I did on canoe trips when I was younger. Back then, we had to carry the canoe on our shoulders over land to get to the next lake. On this day though, having a truck and trailer available made the over-land part of the journey much easier. Mike backed the trailer into the water and soon we were crossing the much calmer waters of White Otter lake. It didn’t take long before the red roof of the castle came into view, and my anticipation only grew as we got closer to the shore. 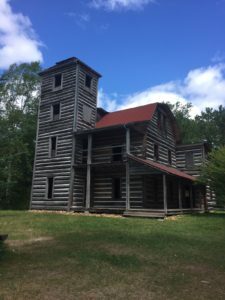 A short time later, I was finally able to set foot inside the awe-inspiring structure that has been sitting on the shore of White Otter lake for more than 100 years. It was a childhood dream come true. I walked through every room, on all three floors, and climbed the steep, narrow stairs to the fourth level at the top of the tower. About 30 minutes later, having seen every level and taken dozens of pictures, it was time to begin the boat ride back to camp. The threatening weather never did materialize, which made the day even better. Seeing White Otter Castle now has a check mark beside it on my to-do list. I want to thank Carol, Barry, Mike, and Laura, from Brown’s Clearwater West Lodge for making this dream happen. Time to review the list and see what I want to accomplish next. Earlier this year, I had an appointment with a neuro-ophthalmologist. I did the usual preliminary tests with the technicians, checking my visual acuity, visual fields, and the little puff of air in each eye to check my inter-ocular-pressure, pretty standard stuff. The doctor also had access to the CT scans and other tests done on me last December when I had the as-of-yet-undiagnosed headache episode. “The doctor called it an infarction,” I said. Hearing the doctor tell me I had a stroke all those years ago surprised me. I mean, I had looked up the word infarction, and it said loss of blood to an area, but the definition I read didn’t use the word stroke, and I never put the two together. 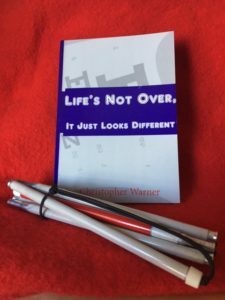 Hearing it called by another name doesn’t change what happened to me, but what has changed is now when I tell people what happened to me at book signings or wherever, instead of saying, “something went wrong”, which had been my standard answer, I could now tell people, I had a stroke at some point during my time in the hospital. A few weeks later, I learned something else I didn’t know before. I was asked to do a presentation to a group about CVI, or Cortical Visual Impairment. Prior to giving the talk, I did some reading up on CVI. I have been living with it for almost 13 years, but I was curious to know if my experience is typical or not. I learned three things from doing the research. One, my experience recovering from CVI has been much different than that of someone born with the condition. Second, I read about the techniques used to help children born with CVI, and that the experts say the sooner the condition is diagnosed, the better the chances are the child will regain more of his or her sight. The third thing I learned from reading about CVI, is that, according to a colleague of mine who works with children, there are no books or studies she is aware of that have been done or written about people like me who acquire CVI later in life. Everything I read was about treating children born with the condition. That last point was the one I found most interesting because while I could relate to some of what I read about how people with CVI perceive the world, I am fairly convinced that anyone who acquires the condition has the advantage of visual memory. I think having an idea of what things looked like when I was fully sighted has given me a different recovery path than someone who never had that experience. I suppose that is at least partly why, despite being diagnosed with a measured acuity of 20/200 and visual fields of 30% in each eye, I’m often told I do very well for someone who is considered legally blind. As I wrote above, the new information I’ve learned in the past few months doesn’t change anything for me, or the way I live my life, but I found the research on CVI really interesting, so I think I found something new to keep studying, and who knows where it will take me in the future. A friend sent me a link to a video that she wanted me to watch. The video professed to have a natural remedy to help people with vision loss regain their sight to near perfect vision. I knew right away that whatever the person in the video had to say, it wouldn’t help me because my sight loss was the result of a brain injury, not a problem with my eyes. Out of respect for my friend, I watched the video anyway. The man in the video began by telling the story of his wife, whose optometrist told her she had an aggressive form of macular degeneration and she’d likely lose her sight in about six months. That’s not the sort of news anyone would want to hear, there’s no question about that. As the video continued, the host was building up to the miraculous cure for vision loss that he would reveal at the end of the video, so I had to stay tuned. Soon though, he started to annoy me. He said the entire industry of eye care and optometry did not want him revealing this secret, and he wasn’t sure how much longer the video would be available for viewing on the internet because they were going to shut him down for revealing his secret. I was starting to lose interest in his over-the-top conspiracy theory, but I kept watching. Minutes later, he encouraged viewers to think about how they’d feel if they were to lose their sight and could no longer see the faces of loved ones or friends. He asked viewers how they’d feel if they became a burden on their family because of their sight loss. That was enough for me. At that point, I turned off the video. His comment made me so angry, I had to walk away from the computer. The conspiracy theory was bad enough, but to state that a person with vision loss would be a burden on those around them was a step too far — more than a step — it was a leap too far! The day after watching the video, I was telling a woman who works with vision impaired students about the video and the host’s statement. She brought up an interesting perspective, saying he was projecting his feelings. I thought about that for a minute, and then I began to wonder about the story he shared about his wife. Would he have thought of her as a burden if his alleged miracle cure hadn’t worked for her? I’m glad she was able to maintain her sight because then neither of them would have to find out if that’s how he truly felt about what life would be like if his wife was to go blind. Who knows, perhaps his wife would’ve been reliant on him and wouldn’t have tried to remain independent, but that would make her the exception, not the rule. Over the past 13 years since losing my sight, I have met many blind or partially sighted people who lead what society would call “happy and productive lives.” Some live on their own, others are in relationships, and many of them have great jobs in a variety of fields. As for me, I have a full-time job I really enjoy, a few different projects on the go in my off time, and I’m in the gym three to five times a week. Anyone who might think I’m a burden is welcome to try and keep up with me. Buffet-style eating is quite common, and for many people it’s a preferred way of eating because each person can choose what he or she would like to eat and how much to put on the plate. I like buffets for those same reasons, but for myself and others with vision loss, buffets can also be a trip into unfamiliar territory, with sometimes unfortunate or humorous results. In May, I attended a three-day conference in Edmonton, and each day, breakfast and lunch was a buffet. I was at the conference on my own, selling my book in a room with other vendors. Each day, I was faced with a catch-22, if I left my table to get food, there was no one at the table to sell the book, but if I didn’t leave the table, I would go hungry, and the first two days of the conference were long days, so going hungry was not an option, so I had to find just the right time to get food. As I mentioned at the beginning, buffets are a challenge for me. I can see that there is food in bowls, trays, or in some form of warming device, but I have a hard time identifying everything in the line. Case in point, at the breakfast buffet, there were trays of pastries and muffins set out, but I can’t tell the different pastries apart, nor can I tell one kind of muffin from another without being able to smell it, which is not an option. I would be very unpopular if I picked up each muffin to smell it and put back the ones I didn’t want. If I’m in the food line with people I know, I’m comfortable asking for assistance identifying what is in front of me, but if the line is filled with strangers, or if I’m alone, then I have to take my chances. Luckily, I don’t have any food allergies, but I do have foods that I don’t like, such as beets, peaches, and grapefruit. One day at the conference, when the lunch buffet was set out, there was a long line of people waiting their turn. Not wanting to leave my table for too long, I waited for the line to quiet down, or disappear altogether, before getting my lunch. I chose a few raw vegetables from a platter, some cold-cuts, and then came upon large bowls with different salad greens in them. I can’t tell one type of lettuce from another, so I just picked some from the first bowl and set it on my plate. Past the greens, I saw what looked like a bowl of white rice. I love rice, but I find plain, white rice bland, so I only put a little of it on my plate. Next, I saw a bowl of something that had been chopped up but I couldn’t tell what it was, and I was the only one at the buffet, so there was no one for me to ask. I took a spoonful of it anyway and put it on my plate. I returned to my table and sat down to eat. I ate the lettuce, some of the vegetables, and the cold-cuts, then lifted some of the rice off of the plate with my fork – and that’s when I discovered it wasn’t rice at all – it was Parmesan cheese! Next, I picked up some of the unidentified chopped item and took a bite, only to realize it was bacon bits. Both were meant to be eaten as part of the salad – but by then I was completely out of salad greens on my plate. Oh well, I guess you could say I still had a salad with the fixings, but I ate everything separately! The following week, I was at another function with some of my co-workers. There was another buffet lunch, but this time I had a co-worker with me who told me what was laid out so I didn’t repeat the parmesan or bacon bits episode. Living with low vision provides an extra layer of challenge to everyday life, and I learned very early on that I have two choices on how I want to face those challenges. I can fight the challenge or embrace it as another one of life’s adventures. Mistaking Parmesan cheese for rice just made my day a little more interesting and it gave me one more story to look back on and laugh.